More than 350 dealers, customers and special guests descended on Bandit Industries’ world headquarters in mid-Michigan on September 12 to celebrate 35 years of continued success, and to check out what’s in store for the coming years, the company said. The celebration included tours of Bandit’s facilities, a behind-the-scenes look at the process of building the most powerful wood processing equipment in the industry and capped off with a demonstration of more than two dozens machines – including brand new, never before seen machines, Bandit said. Morey said Bandit has 50,000 in operation worldwide. Among the equipment demonstrated was the prototype “Mini Beast 1425” grinder. A reconfigured mulch colorant system which places the coloring bar inside the mill of the grinder also was demonstrated using a 3680 beast horizontal grinder. Morey said the unit colors 275 yards per hour using four pounds of colorant per cubic yard. Morey said the newer system, which has been used for about a year, is cleaner and uses less water. Another highlight of the equipment demonstration was the ARJES line of slow sped shredders. 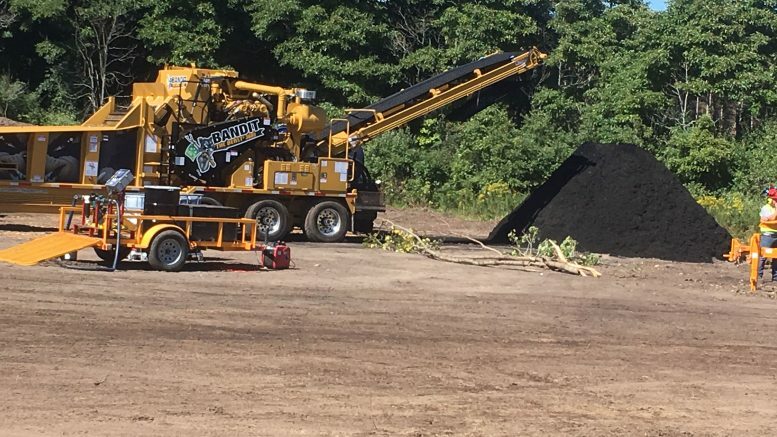 In May, Bandit announced a partnership with Germany-based ARJES to bring the shredders to its customers worldwide. The slow speed shredders handle a variety of materials from cars to concrete and construction waste. After the special Bandit guests had gone home, Bandit opened its doors to the mid-Michigan community for an open house on September 15. Nearly 800 guests dropped by for machine demonstrations, plant tours, food and fun. Bandit Industries has had an amazing 35 years, with new and exciting opportunities for the future, the company said, adding that with the recent announcement of the company going employee-owned, excitement is at an all-time high for Bandit employees and the community. Be the first to comment on "Bandit celebrates 35th anniversary"